In the middle of console launches, next-gen swashbuckling, futuristic otherworldly conflicts, and other fantastic distractions is a little title called Puppeteer. Developed by SCE Studios Japan, the PlayStation 3 exclusive may very well be one of the most unique games I’ve ever played, and one you absolutely should not ignore despite the deluge of incredible entertainment headed our way this holiday season. Puppeteer tells the story of a young boy named Kutaro. He has been captured by the Moon Bear King and turned into a puppet. His captor, having devoured the head of the young lad, casts away his wooden body. Aided by a witch (with her own seemingly sinister motivations), Kutaro sets out to find his head, break his curse, and escape the black castle of the Moon Bear King using a magical pair of scissors called Calibrus. All of this happens before a studio audience on a magical stage. If all of this sounds completely crazy, you have to see the video below to fully grasp just how awesome and nuts it really is. As you can see, the whole thing is essentially the darkest, most quirky, and best magical stage-play platformer ever made. We as the audience (or perhaps the Puppeteer) guide Kutaro and his odd little flying cat/rat companion Ying Yang through their escape from the black castle while trying to free the other unfortunately-imprisoned children. When the witch convinces Kutaro to steal the magical Calibrus scissors, the adventure begins in earnest. [singlepic id=15377 w=320 h=240 float=left]This title is indeed built to take advantage of Sony’s motion controller, but not in the way that you might think. In single player, you’ll use the left thumbstick to control your supporting friends, but in cooperative play you’ll use motion controls. The Move controller is used by a second player to take control of Ying Yang (or the smart-mouthed Pikarina, depending on the level), allowing them to scout ahead, kick loose Moonsparkle collectables (100 of them give you a free life), and otherwise give Kutaro support. It’s great for kids as it allows them to help without tackling the occasionally challenging jumping or cutting puzzles on their own. You can also pull the head off of Kutaro for fun, and I highly recommend it as it’s hilarious. Beyond the heads and magic scissors in the game, Kutaro will also gain access to a few special artifacts in his journey to regain his humanity and return home. It would be sad to reveal them to you beyond saying that they change the combat and exploration elements just enough to keep things fresh throughout the 7 Acts (see? Stage play!) of the game. One artifact I want to address specifically is the aforementioned Calibrus. These magical scissors turn into a primary mode of locomotion and combat in the game. You’ll chop at enemies, eventually turning them into balloons that can be loosed to free the souls of children trapped inside. You’ll also chop leaves, rip seams, and shred fabric both as a method to battle foes, but also as a mechanic of reaching your destination. Cleverly placed leaves can be a spiky way to lose your head, or a slick way to chop your way to an upper part of a level, as you can see in the video above. This is one of those game mechanics that not only works, but puts a smile on your face every time you zip up a ripped seam and fly off the end to catch on to a distant leaf, never touching your little puppet feet to the ground. [singlepic id=15379 w=320 h=240 float=left]Puppeteer looks like a kids game. I would argue that a child could indeed play it, but I don’t think it would be fair to label it a ‘kids game’. The dialogue in Puppeteer remains E for Everyone, but it’s clearly not aimed at the younger set. Similarly, the Moon Bear King, while not overly scary in appearance, is stealing the lives of children, eating their bodies, and turning their souls into “Grubs” – little evil, spiky, foot-soldier creatures. It’s told in a whimsical way, but it is a little more dark and sinister than I’d expected. 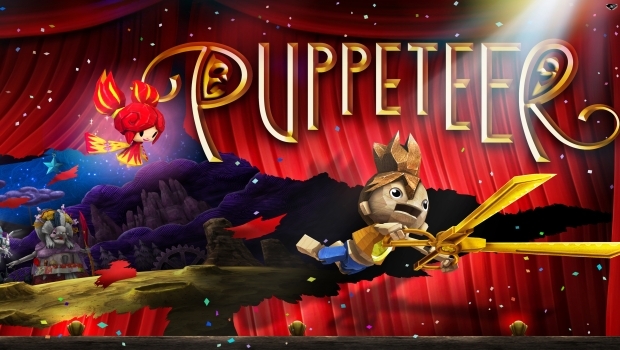 Puppeteer does borrow elements from other games, but not to its own detriment. Combining the absolute best multi-dimensional parts of Echochrome (no surprise, given that it’s from the same studio as this title), the whimsical ragdoll-esque art style of LittleBigPlanet, and the much-improved platforming of LittleBigPlanet 2, you get something that covers the basics of Puppeteer. Somehow that still doesn’t quite cover it, though – this game is far more than the sum of its little wooden puppet parts. Put simply, there is nothing quite like Puppeteer. The unique and challenging platforming, the bonus stages (and having the right head at the right time to access them! ), the clever puzzles, and the audience participation create the best stage play for kids and adults alike. This is your imagination come to life. In a holiday season filled with sequels, heists, and all the action games you can imagine, Puppeteer is different…and different is good.